First Place: River City Tattoo Co.
A Richmond fixture since it was opened by Jessica Simmons in 2002 (and a two-time Best of Richmond winner), River City Tattoo Co. is known at all four of its locations for custom-designed tattoos and piercings, and, of course, "the largest collection of body jewelry on the East Coast." River City also heavily emphasizes its attention to cleanliness standards, and inks only with single-use needles. "We listen to our clients and really try to make what they want work. Many of our stores offer private rooms to get tattooed and pierced in," Simmons says. "We offer a lifetime warranty on most of our jewelry so if you come back for a checkup and a size change we do not charge you again, unlike most other shops." In addition, River City provides tattooist accreditation training and health education training. Cary Street's Salvation Gallery Tattoo also is well known for its custom work, courtesy of its four full-time artists — Katie Davis, Fred Pinckard and newest edition Josh Autrey, as well as "an occasional guest artist." They welcome walk-ins, but you might be better off making an appointment. 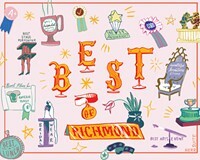 Carytown's Trademark Tattoo is the domain of Amy Black, who also is the readers' choice for Best Tattoo Artist for the third consecutive year.